Okay, things are getting interesting. It would nice if all of the Premier League teams could play all of their games at the same rate so that analysing performance would be so much easier. But no, we have teams who have played 10, 11 and 12 games and that means there is a hidden spread of points in the league table. West Pymble is still cruising along nicely at the top of the table, three points clear and a game in hand. That puts them in a tough place to challenge. Last weekend they didn’t get a run so they will be itching for a game this weekend. This weekend they are away to Berowra who are currently bumping along at the bottom of the table, so I don’t see this match as being a tough day in the office for them. I’d predict a win for Pymble. North Sydney managed to get a run last weekend, playing Berowra at home. They grabbed a win 2:1 which moves them up to second position on the table, two points clear of Kissing Point but they have played one more game. This week they are away to Northbridge. Last time they met it was a goal-fest, with North Sydney bagging five to Northbridge’s two. Let’s hope for something special this week. I think they should have no issue grabbing the points in this one, but the young Northbridge team should not be underestimated. So what’s going on at Kissing Point? Two draws and a then a huge 6:0 loss to Old Barker. Didn’t you have all of your players turn-up? Actually, that’s selling Old Barker short; a side that has really carved its spot into the Premier League this season. Kissing Point are only one point ahead of Lindfield and two points clear of Lane Cove so they need to watch out that they don’t significantly drop down the table. They need a win this week. This week Kissing Point are at home to Knox United. Last time they met it was 4:1 to Kissing Point. This time, based on recent form? I’m not so sure. This will be a significant game for Kissing Point to show they are a top flight team or one that could go into free fall. Lindfield are another team that hasn’t played for a while so they will be itching for a game. They are only one point behind Kissing Point and still in touch with the second spot although a win to Lindfield would still see them trail North Sydney on goal difference. Hot on their heels are Lane Cove and the two teams play each other on Charles Bean this weekend. Last time they met, Lane Cove hammered Lindfield 4:0.Lindfield’s home fortress was breached for the first time this season at their last home game, so this should be an interesting test. I’m not one to predict draws, but with these two sides, it’s hard to see who will get an edge. I guess Lindfield should enjoy the home ground advantage and just edge-out Lane Cove. A mixed season for Lane Cove so far. 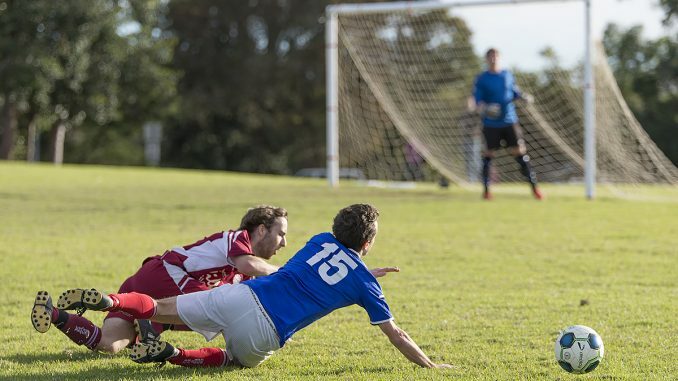 Last outing saw Lane Cove go down to Knox and that hurt them on points and goal difference. They currently have 20 goals for but 24 goals against and that could make all the difference as we hurtle towards the end of season. This week they are away to Lindfield. Lindfield have only lost once this season on Charles Bean Oval, so they should be tough opposition for Lane Cove. However, last time they met Lane Cove won 4:0. I’m tipping Lindfield at this stage, but this game could go either way. Old Barker had a stellar match against Kissing Point last weekend hammering Kissing Point 6:0. Josh Gadsby bagged four of the goals with Matt Vickers and Will Capon grabbing the other two. That moves Old Barker up to sixth spot on the ladder only two points behind Lane Cove although the have played one more game. This week they are away to Chatswood Rangers who trail barker by five points but they have two games in hand. Last time they met, Chatswood only scraped a 1:0 draw during a period for Barker that saw only one win in seven matches. Now Barker are coming off a draw and two wins and that should make them a tough side to contain. Knox United have two games in hand, having played only ten matches so far this season. That puts them at seventh spot on the table on twelve points but they have a poor goal difference with fifteen goals for and twenty-four against. They did get a match during the week, beating to Chatswood Rangers 2:1 away from home which saw them move ahead of Chatswood on the table. This week they play Kissing Point and it’s anyone’s guess who will win. On paper, Kissing Point should win this match easily, but they are coming off a big loss to Old Barker. I think Kissing Point will come out fighting, but Knox are young and fast so they can win this if they can focus for the full ninety minutes. Chatswood Rangers have been doing it tough L-L-D-L and really need a win to get things going. They are eighth on the table but have two games in hand. Wins in both of those games could see Chatswood leapfrog Knox and Old Barker. This week they take on Old Barker who look like they have a bit of fire burning within, so Chatswood are going to have to work hard to keep them under control. They could win this one, but I think it’s going to be a tough ask at the moment. Northbridge didn’t get a run last weekend but did hold Chatswood to a draw in the week before. So far this season they have only won one game, but that doesn’t really tell the full story; they have had five draws and that means they have only lost five matches out of the eleven they have played. So they clearly have the goods, now they just need to finish. However, this week they host North Sydney who are second on the table. Last time they met, North Sydney slammed five goals against Northbridge. But Northbridge grabbed two in that match, so it’s not a complete disaster. I think they will find the going tough, but it should be a good, fast game to watch. What can I say about a team that has won only one game in its last nine matches? I know that half the side has changed this season and the new boys are finding it tough to find their feet. Currently, they are only one point behind Northbridge and seem to be fighting for the wooden spoon.